Chicken Caesar Salad is a simple yet delicious. Savory, fresh, and light are terms that describe this traditional salad, yet if you do three things wrong it can make the difference between a good salad and a great salad. Often times people just throw ingredients together and call it a salad with out taking time to create a beautiful salad that not only looks good but tastes great. Although it takes longer, we recommend making the ingredients from scratch, and doing so will make your salad more interesting and desirable. The first and most important part of making a great chicken caesar salad is to actually make your own chicken. Many people will buy precooked cut chicken and throw it on a salad and call it a day. There’s two things wrong with this. One is that buying precooked chicken costs more. Two is that precooked chicken does not taste as good as home cooked. 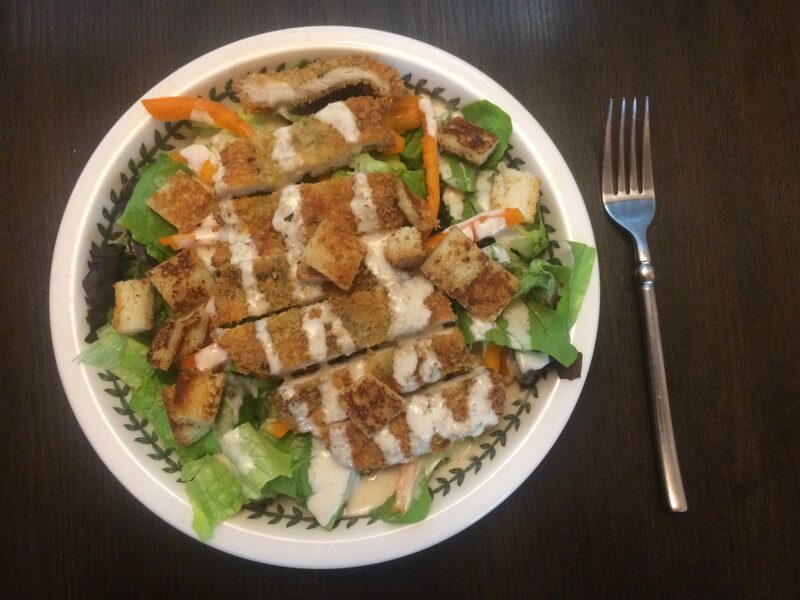 We make our chicken caesar salad with freshly made chicken katsu. 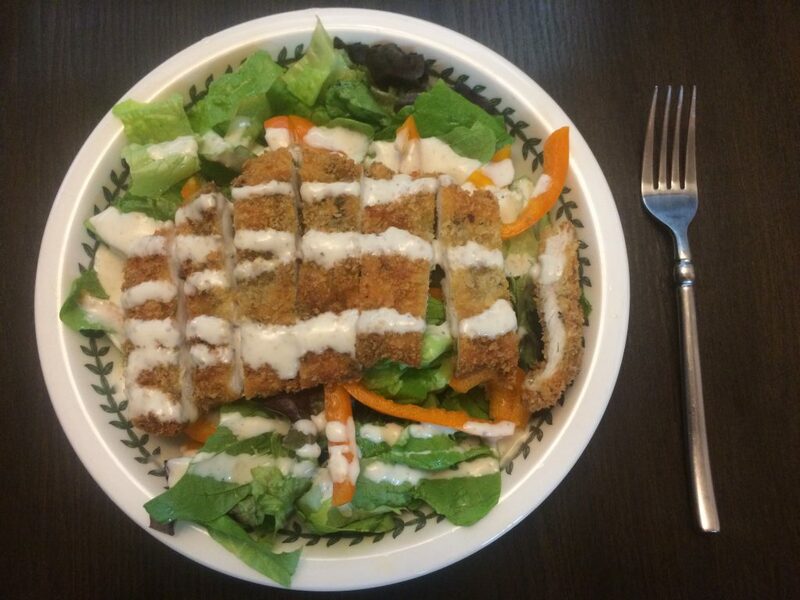 We like chicken katsu because it adds texture to the salad as well has flavor that matches this salad perfectly. You might be thinking, fried chicken is not all that good for you and you are right, but here is the difference. Naked chicken breast baked in the oven has about 152 calories, the same chicken breaded and fried has 265 calories. 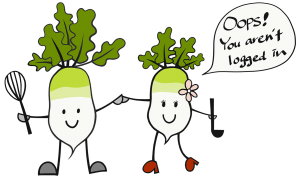 Since we are aiming to eat more greens and trying to eat a salad for our lunch or dinners, making small tradeoffs in the name of making healthy eating more interesting is worth the small trade. If you use a healthy cooking oil such as avocado oil, then there should not be much concern about the healthiness of frying a food. 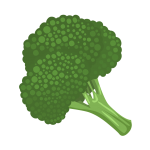 In the end our salad will only amount to less than 500 calories. There’s two additional things that people commonly do wrong making this recipe that we want to share with you. We reserve our best tips, tricks, and secrets for registered members or people who will share our content. Please either login or create a free account by registering or simply use a social media account to share. 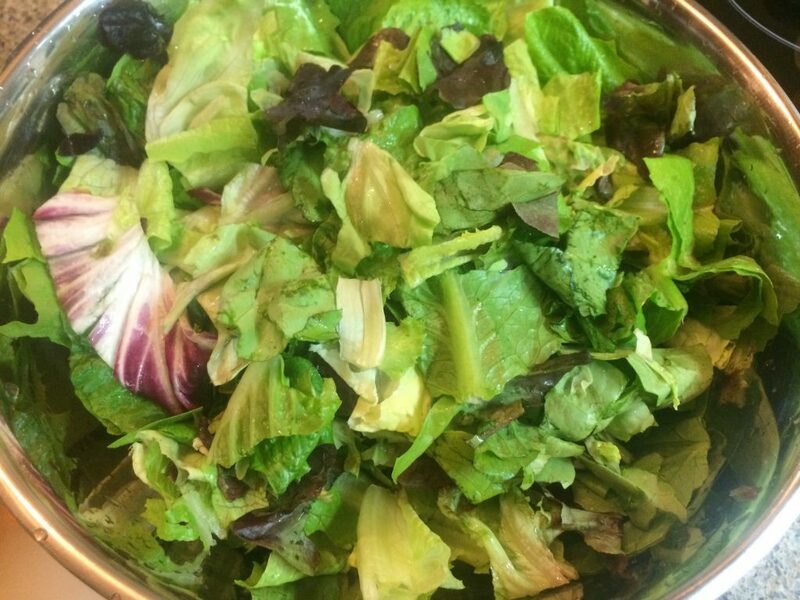 Wash lettuce, shake off water, tear into pieces, divide into two bowls (I also added some mixed greens). 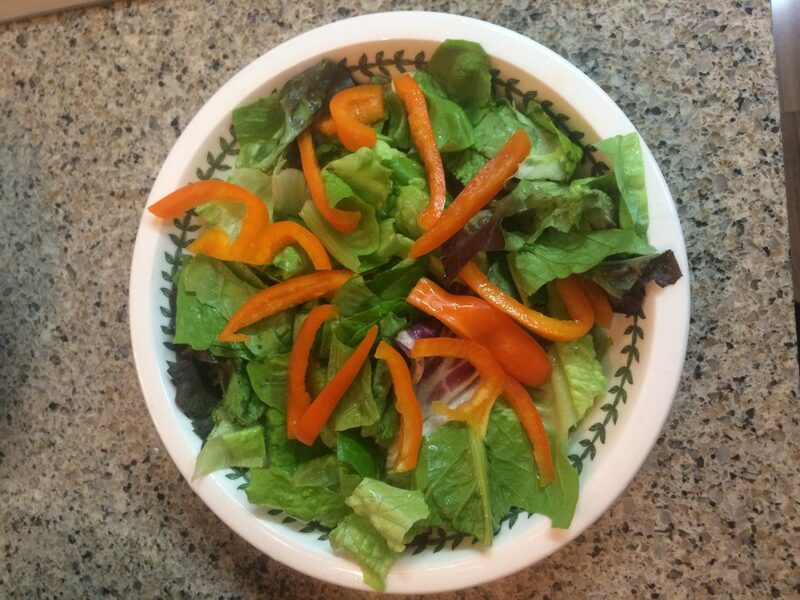 Slice bell pepper into strips, divide strips and add to top of lettuce. 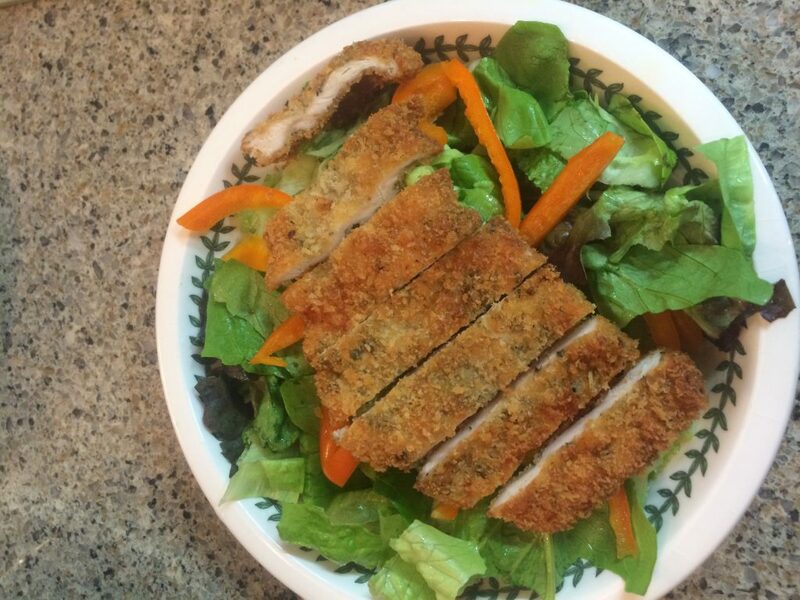 Cut chicken katsu into strips, divide strips and add to bed of lettuce. Drizzle caesar dressing over the top of the salad. 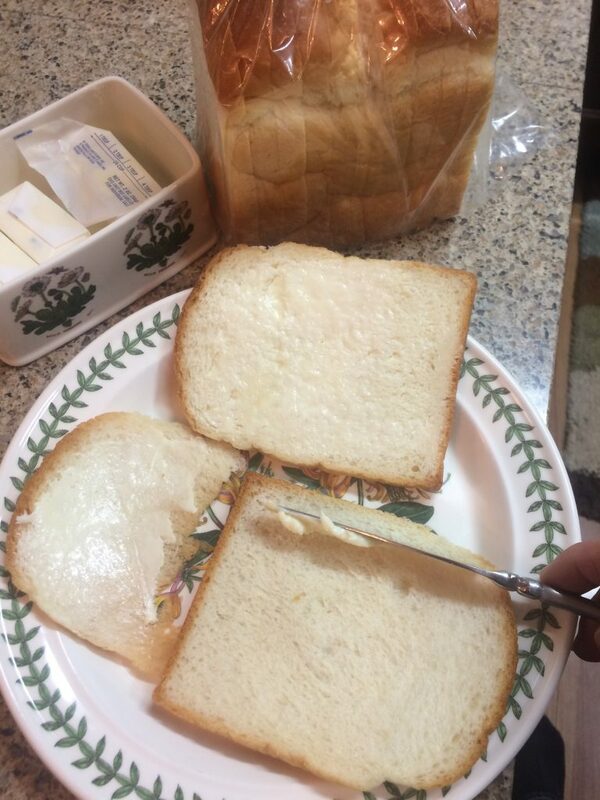 Butter a slice of bread, sprinkle with garlic salt, toast in frying pan. 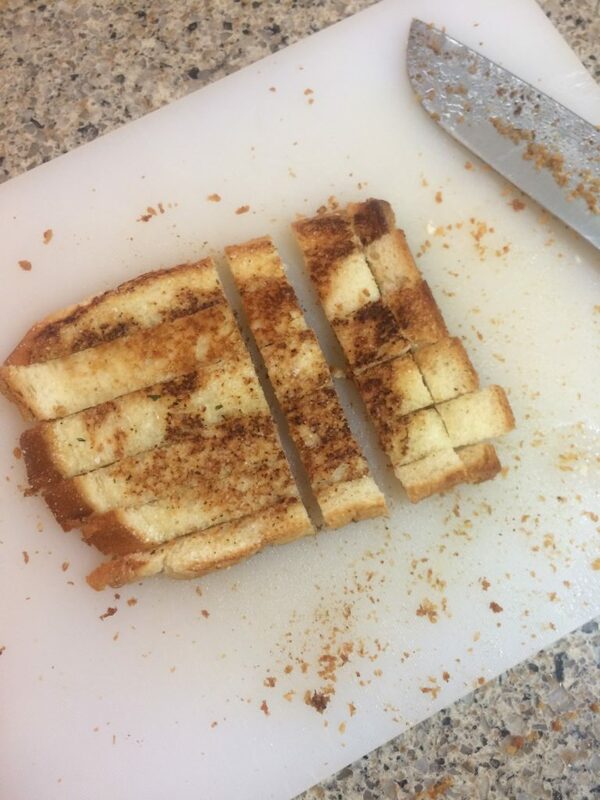 Cut garlic toast into squares, add to top of salad. Ingredients are important when making this recipe. If you use the best ingredients then your result will turn out for the best. Some recipes for caesar dressing call for lemon juice, but make sure to add it if your recipe does not call for it. Adding lemon juice will add to the shelf life of storing your caesar dressing. Also when you store the sauce to use another day, store it in an air tight container such as a mason jar. The first and most important part of making a great chicken caesar salad is to actually make your own chicken. Many people will buy precooked cut chicken and throw it on a salad and call it a day. There's two things wrong with this. One is that buying precooked chicken costs more. Two is that precooked chicken does not taste as good as home cooked. 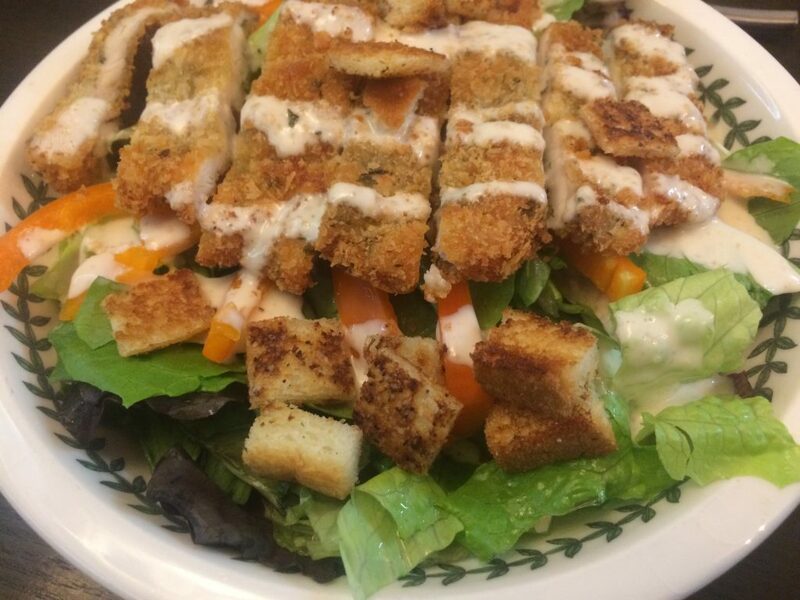 We make our chicken caesar salad with freshly made chicken katsu.